La Mansarda Iblea, for a peaceful holiday, in a country "on a human scale". Property 24: La Mansarda Iblea, for a peaceful holiday, in a country "on a human scale". Villa Cristina with garden and lots of greenery. Property 33: Villa Cristina with garden and lots of greenery. Property 43: Elegant villa with pool, air conditioning, fireplace, WiFi, panoramic position, 8 pers. Definitely a room with a view! Amazing panoramic view and great location. Lovely to sit out on the terrace with coffee in the morning. Easy to park in the free parking at the bottom of the hill and walk up to the apartment. The bedroom is large and bright with very comfortable bed and linens. Really enjoyed our stay and Ragusa Ibla! Salvatore and his lovely apartment exceeded our expectations! 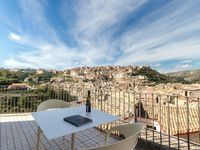 The apartment is perfectly located to explore Ibla and the rest of Ragusa easily by foot. The view from the very nice space is otherworldly and makes for a great home away from home.